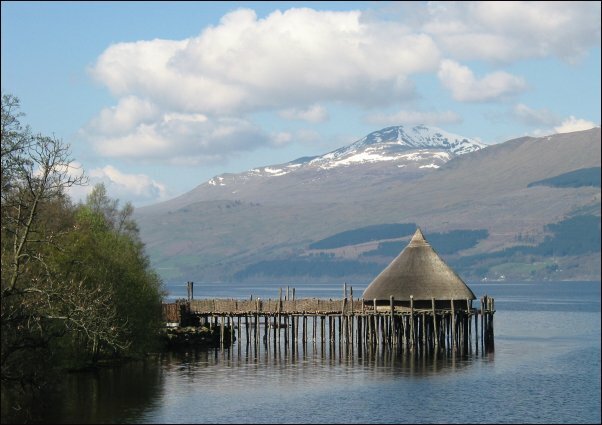 The reconstructed crannog on Loch Tay, with Ben Lawers beyond. Crannogs were used as defensive dwellings from as early as the Neolithic Age (5000 years ago) to as late as the 17th Century. They were built by driving timber piles into shallow parts of the lochbed, which then became the supporting frame for the round house itself. Years of sub-aqua research by a team of archaeologists from Edinburgh University on the Oakbank Crannog (about 5 miles further along Loch Tay) has given us a good picture of how the people lived on these impressive dwellings, and the Loch Tay Crannog is open to visitors everyday day from Easter to October. If you can't visit the crannog in person, see www.crannog.co.uk for more information. If you want to visit the crannog during your holiday, this is possible on any of the routes below. Copyright © Transcotland Ltd. 2002.